This is the third in my occasional series of “Books on the Horizon” – travelogues I dream of researching and writing, though probably never will. My “Books on the Horizon” are an exercise in creativity, idle whimsy and – through any reactions I get – testing the water. Jenas la tria en mia fojfoja serio de “Libroj sur la Horizonto” – vojaĝoverkoj pri kiuj mi revas esplori kaj skribi, sed eble neniam faros. Miaj “Libroj sur la Horizonto” estas ekzerco de kreademo, pigra mensumo kaj – per iaj ajn reagoj kiujn mi ricevas – testado. Legu pli pri la serio en ĉi tiu enkonduka paĝo, kaj vidu la ideon kiu inspiris ĝin – La Maleblaj Libroj de Keith Kahn-Harris (angle). A dull title, but it is self-explanatory: travelling the world through the international language Esperanto. Malsprita titolo, sed estas memklariga: vojaĝante tra la mondo per Esperanto. The international language Esperanto is so geared to travel, I’m disappointed not to have combined the two more often in my four or so years as a speaker. More than that, I’m surprised that nobody has done this book before – at least that I know of. The core idea has been done many times, but no book has been written about it quite like this one that I would propose. Though I’d love to hear if I’m wrong. La internacia lingvo Esperanto estas tiel vojaĝiga, mi bedaŭras ke mi ne kunigis la duon pli ofte dum mia ĉirkaǔ kvar jaroj kiel parolanto. Plue, mi surpriziĝis ke neniu faris ĉi tian libron – almenaŭ, kiel mi scias. La kerna ideo multe fariĝis, sed nenia libro verkiĝis tute kiel ĉi tian, kian mi proponus. Sed mi amus aŭdi se mi malpravas. I have a fair to middling fluency in Esperanto. While I’ve never done a formal test I’d reckon I’m about B2, maybe better, on the Common European Framework of Reference for Languages. I’ve had to look up or confirm only a small number of words in translating this blog post (however, there may be many errors that I’ve not noticed). Mi havas mezan fluecon en Esperanto. Mi neniam formale testiĝis, sed mi pensas ke mi atingus ĉirkaŭ B2, eble pli bone, sur la komuna eŭropa referenckadro por lingvoj. Kiel gvido, mi devis trovi aŭ konfirmi nur malgrandan nombron da vortoj tradukinte ĉi tiun blogafiŝon (tamen, eble estas eraroj kiujn mi ne vidis). I use the language at home everyday, online as much as I can, and around Scotland from time to time. I’ve even (on two occasions so far) used it abroad. I’d love to use it more, especially abroad, and this is where this book comes in. Mi uzas la lingvon hejme ĉiutage, rete tiom multe kiom mi povas, kaj ĉirkaŭ Skotlando fojfoje. Mi eĉ (dufoje ĝis nun) uzis ĝin eksterlande. Mi amus uzi ĝin pli ofte, speciale eksterlande, kaj tial alvenas ĉi tiu libro. The idea is to undertake travels around the world using Esperanto as my foundation. I would hunt down and meet with Esperantists, visit locations around the world important to Esperanto’s history, and study the language as much as possible as I go. La ideo estas klopodi vojaĝojn trans la mondo, uzante Esperanton kiel mia fundo. Mi trovus kaj renkontus Esperantistojn, vizitus lokojn ĉirkaŭ la mondo gravajn por la historio de Esperanto, kaj studus la lingvon tiom eble dumvojaĝe. There would be some fascinating encounters. On a personal level, there are Esperantists I have got to know a little through Google+ from countries like Germany, Brazil, France, the Netherlands, Japan and the USA, and it would be lovely to meet some of them face to face. There are some key sites in the Esperanto story, such as Białystok in Poland (birthplace of Esperanto’s creator), the famous Esperanto Museum in Vienna, an Esperanto Cultural Centre in the Loire Valley, and even apparently a commune and school for disadvantaged children in Brazil that uses Esperanto. Estus fascinaj renkontoj. Persono-nivele, estas Esperantistoj mi iom ekkonis per Google+ el landoj kiel Germanio, Brazilo, Francio, Nederlando, Japanio kaj Usono, kaj mirindus renkonti kelkajn el ili enpersone. Estas gravaj lokoj en la esperanta historio, ekzemple Bjalistoko en Pollando (naskiĝloko de la kreinto de Esperanto), la fama Esperanto-museo en Vieno, esperanta kulturcentro en la valo Loire, kaj eĉ komunumo kaj lernejo por malavantaĝataj infanoj en Brazilo kiu uzas Esperanton. There are also Esperanto clubs and gatherings in cities all over the world, and a regular series of national and international congresses, cultural gatherings and training courses that could be easily weaved into an itinerary. Ankaŭ estas esperantaj kluboj kaj kunvenoj en urboj ĉie tra la mondo, kaj regula serio de naciaj kaj internaciaj kongresoj, kulturaj kunvenoj kaj trejnadaj kursoj kiu facile enplaniĝus. So the book is rather limitless in scope, with endless opportunities to use the language in all the continents and probably most countries. Though those places mentioned above would probably be a good initial set of destinations. Do la libro estas iom senlima en fako, kun senfinaj okazoj por uzi la lingvon en ĉiuj kontinentoj kaj eble la plejparto de landoj. Sed tiuj lokoj supermenciitaj eble estus bona komenca lokaro. And I would have some specific objectives in the book. First, to reflect on my own personal journey of learning the language. Second, to tell a bit of Esperanto’s story as I go – the creation of the language and the growth of the movement. Third, to meet new people, see new places, and do a bit of conventional travel writing. Kaj mi havus specifajn klopodojn en la libro. Unue, pripensi mian propran personan vojaĝon de lernado de la lingvo. Due, diri iom da la rakonto de Esperanto dumvojaĝe – la kreado de la lingvo kaj la kreskado de la movado. Trie, renkonti novajn homojn, vidi novajn lokojn, kaj fari iom da kutima vojaĝo-verkado. In short, it would be a mix of memoir, history and travelogue. Whatever happened on the road would help dictate the balance between the three, but I think it would be mainly travelogue. Mallonge, estus mikso de membiografio, historio kaj vojaĝa verko. Kio ajn okazis dumvoje helpus klarigi la ekvilibron inter la tri, sed mi pensas ke ĝi estus plejparte vojaĝa verko. As rather important side note – the book would probably be bilingual. Because of the difficulties of formatting bilingual text in ebooks, I imagine all formats would be paragraph-by-paragraph of parallel text, like this blogpost. That has the advantage of making Esperanto more familiar and understandable as you read. Kiel iom grava flanko-noto – la libro eble estus dulingva. Pro la malfacilecoj de formigi dulingvan tekstaron en elektronikaj libroj, mi imagas ke ĉiuj libroformoj estus po alinea paralela teksto, kiel ĉi tiu blogafiŝo. Tiu havas avantaĝon pli familiarigi kaj pli komprenebligi Esperanton dumlege. A tricky question. 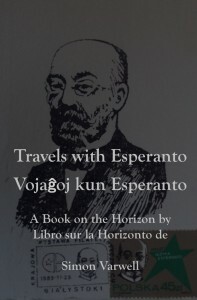 I’m not the only Esperantist capable of writing a travel narrative, and I’m certain I’m not as fluent as I should be to undertake this mission, not least the translation into Esperanto (assuming I write in English first). However, I guess I would be at an acceptable competence after a sufficiently long and deep period of research and travels. Malfacila demando. Mi ne estas la sola esperantisto kiu kapablas skribi vojaĝverkon, kaj mi certas mi ne sufiĉe fluas tiom, kiom mi devus por klopodi ĉi tiun taskon, speciale la traduko esperanten (supoze mi skribas angle unue). Tamen, mi divenas ke mi estus ĉe akceptebla kapablo post sufiĉe longa kaj profunda tempo de esplorado kaj vojaĝado. My strengths, however, are that I’d bring the fresh perspective of a (relatively) new speaker, the experience of a seasoned (ish) traveller, and an enquiring and open mind. Miaj fortaĵoj, tamen, estas ke mi portos la freŝan vidpunkton de (iom) nova parolanto, la sperton de oft-faranta vojaĝanto, kaj esploreman kaj malferman menson. Achieving fluency, meeting new people, seeing wonderful new places, and inspiring others to look into Esperanto. PRI KIO MI PLEJ FORTE ESPERUS? Atingonte fluencon, renkontonte novajn homojn, vidonte mirindajn novajn lokojn, kaj inspironte aliulojn esplori Esperanton. The risk of a lack of direction to such a potentially open-ended concept, my Esperanto not being good enough in the early stages, and poor discipline in improving it as I go. PRI KIO MI PLEJ FORTE TIMUS? La risko de manko de direkto por eble tiom senlima ideo, mia Esperanto ne estonte sufiĉe bone dum la unuaj partoj, kaj malbona disciplino plibonigante ĝin dumvoje. This entirely depends. How much I am able to do would depend on how much time and money I have. To do all the things I mentioned above, and more, in a meaningful, unrushed way, could easily use up six months and about ten thousand pounds. That would be a full and thorough book, but for the idle reader it might end up plodding and cumbersome. KION MI BEZONUS POR SKRIBI ĈI TIUN LIBRON? Ĉi tiu tute dependas. Kiom mi eblos fari dependas de kiom da tempo kaj mono kion mi havas. Por fari ĉiujn de la aĵoj kiujn mi menciis supere, kaj plu, laŭ signifa, ne rapida maniero, povus facile uzi ses monatojn kaj ĉirkcaŭ dek mil pundojn. Tio estos plena kaj funda libro, sed por la malserioza leganto ĝi eble esti malrapida kaj tro peza. If you were to limit me to, say, one month and one or two thousand pounds, I could probably get around half a dozen or so European destinations and explore a few interesting and meaningful stories. That would in some ways be a satisfyingly tight book, but it might feel frustratingly rushed, at least to me or to someone with a deep interest in the subject matter. Perhaps it could be a series? Se vi limigas min al, ekzemple, unu monato kaj unu aŭ du mil pundoj, mi eble atingos ĉirkaŭ ses eŭropajn lokojn kaj esploros kelkajn interesajn kaj signifajn rakontojn. Tio iumaniere estus kontente strikta libro, sed eble montriĝas kiel frustre rapida, alemenaŭ laŭ mi aŭ iu kun profunda intereso en la temo. Eble povus esti serio? My experiences of Esperanto thus far, if I were to write them up, would probably already represent a half-decent first couple of chapters. And I am bound to continue finding interesting stories about the language – through the books I read, people I meet, and places I visit. I have a general rule in life that when I go abroad (especially if alone and to a non-English speaking country) I’ll try to get in touch with local Esperantists. Miaj spertoj ĝis nun, se mi skribis ilin, eble formus iom bonan ĉapitron aŭ du. Kaj mi certe daŭros trovi intersesaĵon pri la lingvo – per legante librojn, renkontante homojn, kaj vizitante lokojn. Mi havas generalan vivregulon ke kiam mi iras eksterlanden (speciale se sole aŭ al neangla parolanta lando) mi trovos kontakti lokajn esperantistojn. So arguably I should and could already be writing this book. But at my current passive pace and direction, it would be a rudderless book and several years down the line. Do disputeble mi devas kaj povas jam skribi ĉi tian libron. Sed laŭ la nuntempa neaktiva paŝo kaj direkto, estus sengvida libro kaj nefinata antaŭ multe de jaroj. I would therefore love to have both the funds and time to do a dedicated exploration of the world of Esperanto, but the chances of me having either any time soon are very slim. Tial mi amus havi kaj la monon kaj la tempon por farigi celplenana esploradon de Esperantio, sed la ŝanco ke mi havos unu el la du ajnatempe baldaŭ estas tre malgranda. Kion vi povas? Ĉu ĉi tiu estas leginda libro laŭ vi? Diru al mi per la suba komentujo. Kaj legu la restantan parton de mi serio de Libroj sur la Horizonto (en la angla) ĉi tie.